Universitas Muhammadiyah Semarang (Unimus) successfully held a one-day training on leadership entitled ‘Growing Leadership’ in the hall of Unimus on April 10, 2018. The training was opened by the Rector of Unimus and attended by 98 participants, consisting of structural officials on university, faculty and study program levels as well as advisors of student activity units at Unimus. The training was given by Prof. Dr. Fathur Rokhman, M.Hum. (Rector of Unnes), an expert at Growing Leadership. Prof. Fathur stated during the training that “… in the disruptive era, universities are built not by power but trust and moving speed in order to get a massive vision. Thus, a visionary leader is urgently required. Growing leadership is a principle of leadership centered on the development of self-quality of a leader and the surrounding people,” Prof. Fathur said. a growing leadership is like trees that start from seeds of leadership, empower trees of leadership, and build a network of trees of leadership to become resilient during a hurricane and able to sow leadership tasks,” he added. He also stated in the training that a growing leadership taught us about how to lead in the era of change. “There are some important principles in a growing leadership. They are: prioritizing humanity, using spiritual values in running the leadership, using leadership as a source of goodness, and becoming a kind and generous. A seed of leadership should be supported with integrity, intellectuality, and hard work. Network of leadership needs also to be strengthened by learning to become a good listener and open-minded,” Prof. Fathur emphasized. Agung Yulianto, S.Pd., M.Si. (Co-trainer 2) during material presentation on how to implement growing leadership principles in the formulation of a vision and program. The agenda was designed interestingly, starting from a material presentation by Prof. Fathur on strategies and principles of a growing leadership, followed by a material presentation about promoting the reputation of a university as well as facilitation and discussion on the preparation of vision, missions, objectives, and roadmap of a university, which was guided by a reliable co-trainer from Unnes. The first co-trainer (Hendi Pratama, S.Pd., M.A.) discussed about how to implement the principles of a growing leadership by building networks and reputation. Meanwhile, the second co-trainer (Agung Yulianto, S.Pd., M.Si.) talked about how to implement the principles of Growing Leadership in the formulation of a vision and program. 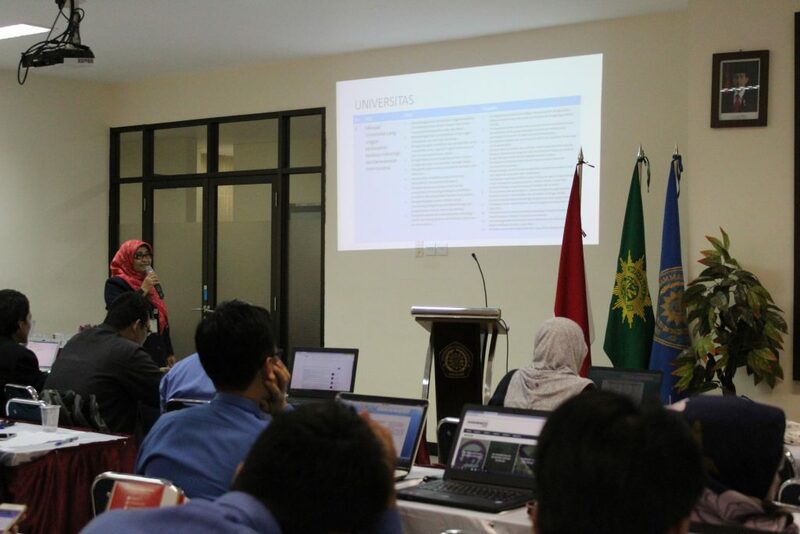 At the end of the session, the participants were asked to present the vision and missions of units that they were managing, on either study program, faculty, or university level.